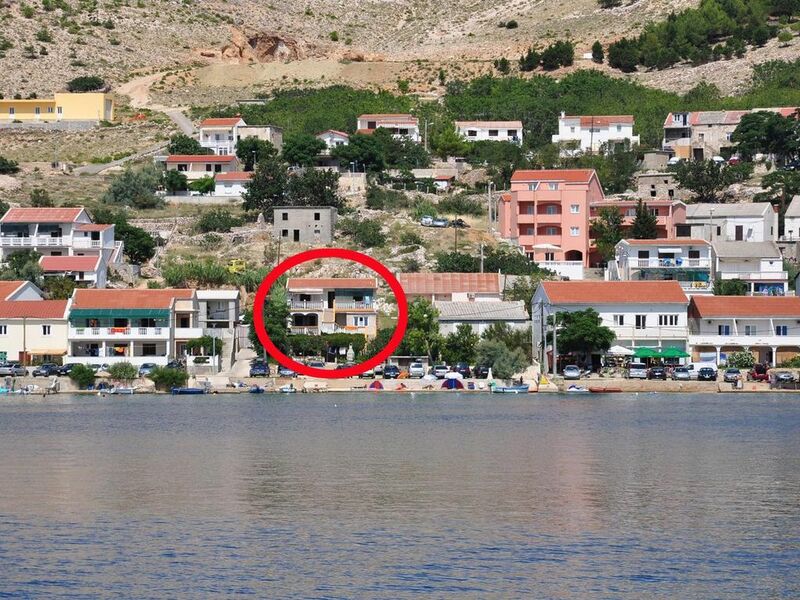 House 6352 in the town of Metajna, Pag - Kvarner has accommodation units of type Apartment (4) and is 10 m away from the sea. The nearest beach to this accommodation is a pebble beach. The house is categorized as "Facilities near a beach". As the house is divided into several apartments, other guests are likely to be present during your holiday. The hosts will be in residence during your holiday. The house owner is under no obligation to accept additional persons and pets that were not stated in the reservation request and it is necessary to report them in advance. Apartment can accommodate 4 guests. Beds are situated in 2 sleeping rooms, within 50m2. Guests can enjoy a sea view from the private terrace. Food can be prepared using barbecue which is shared with other guests too. INCLUDED IN THE PRICE: tourist tax, final cleaning, air-conditioning, parking, internet, boat mooring, iron, ironing board, hairdryer, portable barbecue, sunshade. Jednoduché, ale čisté ubytovanie na fantastickom mieste doslova na skok od vody. Majitelia Ivan a Snežana sú veľmi príjemní ľudia. V meste pár minút chôdze od domu sú dva obchody, tri reštaurácie s ponukou čerstvých rýb, a bary so všetkým čo človek potrebuje. Opaľovať a kúpať sa dá priamo pred domom - betónové mólo, plus betónová plocha vedľa a tak isto plocha s drobným štrkom.Kamienková pláž priamo v meste asi 5 minút chôdze. Pláž Ručica je tiež na skok od ubytovania. Asi 5 minút autom a zvyšok cca 100 metrov pešo z parkoviska. Je čistá (upratovaná každý deň), a nikdy preplnená. Je tu absolútny kľud bez stánkov s občerstvením alebo podobných rušiacich vecí. Čokoľvek potrebujete(jedlo alebo nápoje) si vezmete so sebou a čo nemáte , nepotrebujete. Toto miesto odporúčam každému kto chce stráviť kľudnú dovolenku mimo hlučných preplnených rezortov. A ak by ste predsa len potrebovali trocha viac ruchu a zábavy, zopár kilometrov od Metajna je známa ZRČE BEACH (skôr vhodná pre mladých ľudí), mesto Novalja, a tak isto Hlavné mesto PAG je vzdialené nie viac ako 30 minút cesty. Simple, basic, but clean accomodation in fantastic place, just a stone throw from the sea. Owners - Ivan and Snežana are very nice and helpful people. Right in the centre, few minutes walk from accomodation there are two shops with everything you might need, restaurants offering freshly caught local fish and bars with everything you need. Swimming and sunbathing is available right in front of the house, and local town beach is just 5 minutes walk away. Well known RUČICA beach is just 5 minutes drive and then just100 meters walk from car park. Beach is very clean(maintained daily) and what is more important - it is never crowded. It's very quiet without any hassle of food stalls or whatever that would disturb peace and quiet nature of the place. Whatever you need you can bring with you( snacks and drinks) and whatever else you don't need... I would recomend this place to everyone looking for quiet place for holiday to refresh and fill up with energy. Should you ever need a more busy place with lots of people - very popular ZRČE BEACH with it's clubs and music is not far away(15 minutes drive from Metajna) nearby town of Novalja. Also capital PAG(small historic town with its narrow streets and old buildngs) is about 30 minutes drive.